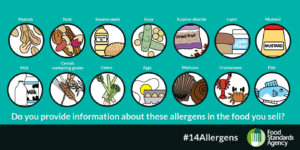 Do you provide information about the allergens in food you sell? In the UK, it is estimated that 1-2% of adults and 5-8% of children have a food allergy. This equates to around 2 million people living in the UK with a food allergy, this figure does not include those with food intolerances. This means the actual number of affected people living with food allergy and/or food intolerance is considerably more. All staff, including temporary staff and contractors involved in the food production process should be aware of Food Allergens and the consequences should they be consumed by anyone with a food allergy. There are many procedures that can be put into place to avoid such events, for example Handwashing, Cleaning, Storage and dedicated equipment. We offer E-Learning courses in Allergen Awareness, which is ideal for anyone that works with, handles or sells food. and, Allergen Awareness in manufacturing, which is ideal for anyone involved in the manufacture of food products. click here for more information on Allergen Awareness courses available.